The Barristers Group is pleased to announce that Mr Elmardy was awarded $80,000 in damages, increased from the original decision of $27,000 in 2015. The appeal was presented to a panel of Divisional Court judges who increased the total damages police must pay. Andrew MacDonald was interviewed by Matt Galloway on Wednesday May 13, 2015 regarding his client being assaulted by a Toronto police officer during a forceful arrest. Check the termination clause in your employment contract – you may have contracted out of a right you never knew you had. If you are fired you may be out thousands of dollars. If you are an employee – you HAVE to answer this question BEFORE you sign a written employment agreement. Here’s why. 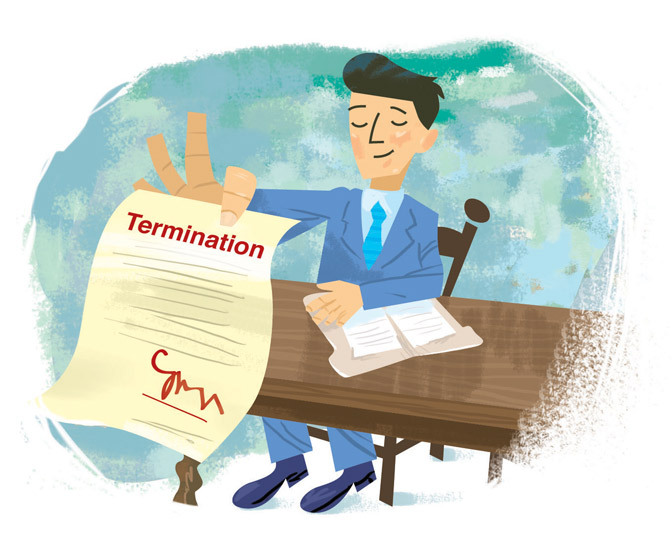 At the time you are hired you have rights to common law notice at the time of your termination/firing. The common law is the decisions of judges that have been reported over the past few centuries including British reported cases. The cumulative effect of those decisions is the common law. Your employer can terminate you at any time, without cause, but they have to give you reasonable notice or pay in lieu of notice. Common law notice at termination is determined by balancing factors such as age, seniority, job climate, health, nature of the job etc… it could work out to as much as 2 months’ for every year of service or more, or less, depending on balancing the factors. Increasingly companies are inserting clauses into employment contracts that take away your common law rights. Instead they limit employees to notice and severance provided under the applicable provincial Employment Standards Act (ESA). Employers are turning what is a minimum standard created by the ESA (a notice/severance floor) into a maximum entitlement (a notice/severance ceiling). Employees are falling into this trap. If your job is not a minimum wage job why would you expect a minimum standard of notice/severance upon termination? Employees should be objecting to this kind of clause at the time of hire. Instead employees are unwittingly signing their entitlement to a fair severance package away by contracting out of their right to common law notice. The financial impact for employees is staggering. Let’s use Paul as an example. At the beginning of December he has just lost his job after 4 3/4 years of service working as a senior manager in a midsize Canadian corporation based in Ontario. He is shocked to learn that his employer will be giving him 4 week’s pay as a package. “Why so little” he asks HR. “Because your contract says so” is the response. Paul works in a field where there are few jobs in his city. It’s the holiday season. He can’t possibly find another comparable job in 4 weeks and has significant monthly debts to pay. He is 46, which in his business is old. He is the sole bread winner in his family. His contract provided that upon termination he gets notice or pay in lieu of notice or severance equivalent to what is provided for in the Ontario ESA and no more. He even expressly acknowledged he was not entitled to common law notice. This clause meant nothing to John at the time of hire. To get what was set out in the Ontario ESA seemed fair. He didn’t know what common law notice meant. Paul’s annual salary was $120,000. His Ontario ESA entitlement of 4 weeks’ pay in lieu of notice works out to $9230 gross. At common law his conservative range of entitlement would likely be between $50,000(5 months) and $70,000(7 months). But depending on a balancing of the common law factors it could be even more. The cost to Paul at termination and corresponding benefit to his employer is between $40,770 and $60,770. That’s money Paul and his family could have used given he is now out of work and looking for a job. Why would an employer get an employee to contract out of a legal right? Because they know it will save them money when the relationship ends. Why do employees step into a trap by agreeing to a contract clause that takes away a right and potentially costs them tens of thousands of dollars? Ignorance? Timidity? A trusting nature? Desperation? Don’t contract out of your common law right to notice upon termination. Don’t accept a provincial Employment Standards Act minimum, as a “maximum” entitlement. If an employer is going to pull the wool over your eyes before you even start – is this a place you really want to work. Ask the tough question in your interview process – or at any point you are asked to sign a written employment agreement – am I being asked to contract out of a legal right to common law notice and if so why? If enough employees ask the question – the practice will be exposed and stopped – and vulnerable employees will be better protected by their common law right to receive reasonable notice upon termination. Andrew MacDonald represents innocent man stopped by the Toronto police who successfully claims Charter infringements and is awarded punitive damages and damages for Charter breaches. The story has also been picked up by the Toronto Star and the Globe and Mail.